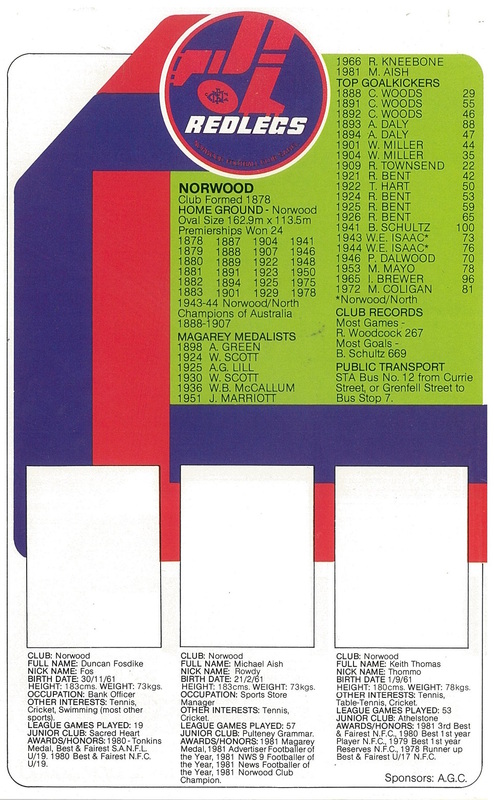 If you were a kid in Adelaide in 1982 you may’ve had this album and even managed to get through enough flapjacks to fill it with stickers. Some 34 years later I discovered it at A Toss Of A Coin and thought I’d share it. Sticker-less as it is (they now cost as much as $10 each), there’s plenty here for nostalgic crow-eaters to delve into. 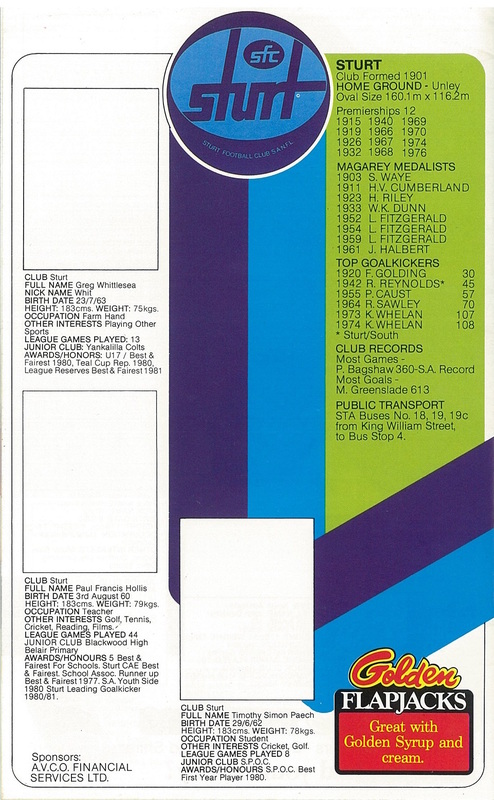 Nicknames, occupations and junior clubs are a highlight. Not to mention public transport routes to each ground. 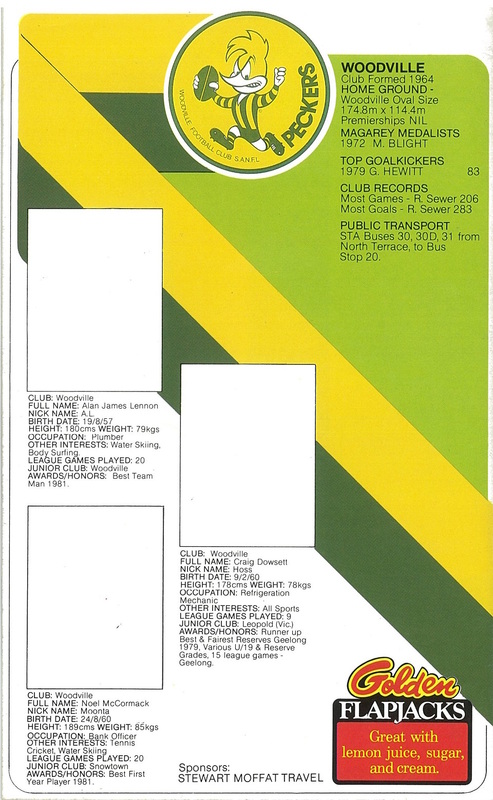 The 1982 season programme, colour coded for venue and spaces to record the scores. After a year of eating nothing but flapjacks, you send your completed album off to Regency Park to win one of three prizes – hopefully you got the album back. Bulldogs: A future Crow and Hawk here – a Magarey and Brownlow await. Parabanks Shopping Centre still going strong. Tigers: Kernas was chalking up the stock exchange before chalking up goals across two states. 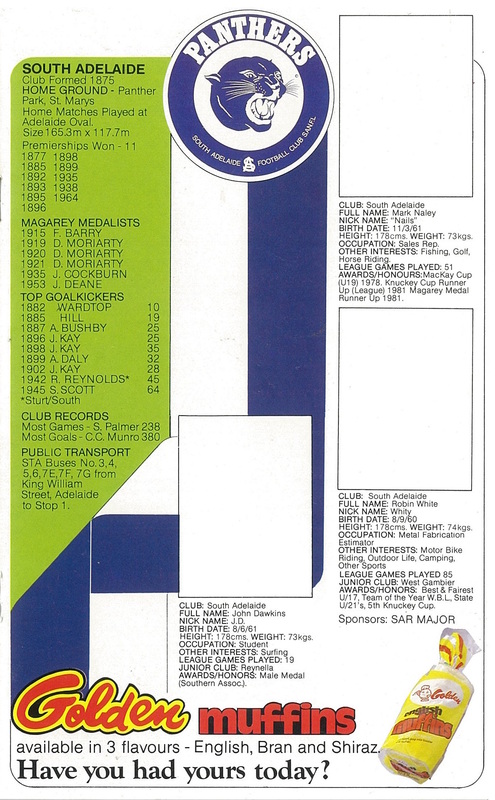 Muscles looking strong for the ’82 Magarey. The local high school producing the goods. Roosters: Yes, John Riley really was an Atomic Physicist – he also played a game for Footscray. They don’t call it the Ken Farmer Medal for nothing. Redlegs: The Premiership list gets longer by season’s end. Aish coming off a Magarey in his third seasons, has a few more games left in him. KT was unemployed but things work out for him. Magpies: Can someone explain Kym Kinnear’s nickname? Gippy soon heads off to join the other Magpies. One, two, three, four Magareys for R.F Ebert. Panthers: Still waiting for that 12th premiership. Nails heads across the border a few years later and wins one with Carlton. Shiraz flavoured muffins? Sturt: Whittlesea in just his second season, goes on to win a Magarey and play four games for Hawthorn in their ’91 premiership year (but not the GF). Bagshaw’s SA games record is soon overtaken. Bloods: Special buses to Richmond for ‘top games’. Stephen Rechner’s profile raises many questions. Was John Kantilaftas a red head? Eagles: Bob Enright has a 6-month old nephew (thanks Mickey R) that looks like he could be a 300-gamer. Scruff Hanna responds honestly to the ‘interests’ question. Be sure to eat Golden crumpets when not eating Golden flapjacks or muffins. 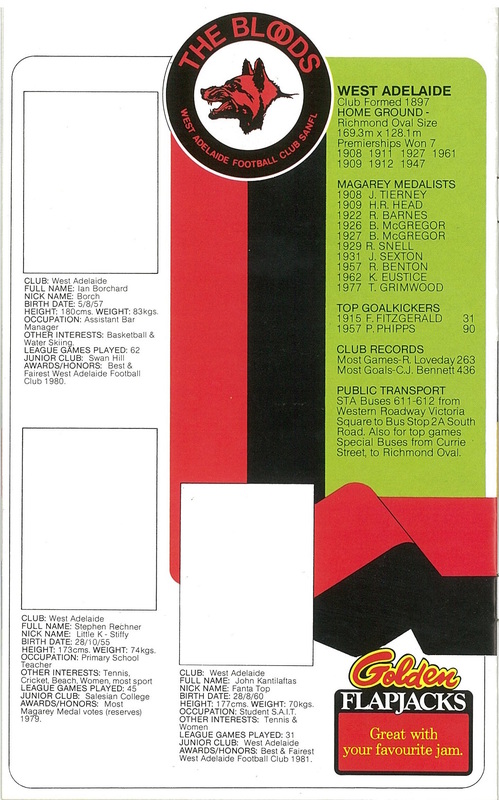 Peckers: What Woodville lacks in club milestones they make up for in a great logo and nickname. Blighty would’ve got a sticker had he not been at the Kangaroos that year. Finishing on a high. Some of his best work wasn’t uncovered until 2008. A curious selection of names there, some rookies, some State players. I reckon you could spend the day online assembling virtual stickers. 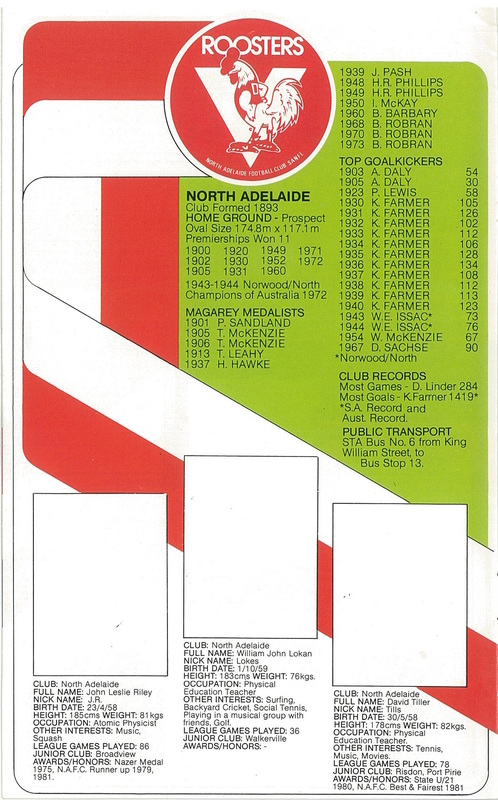 For my mob, they managed to get the team name wrong, the name of our first top goalkicker wrong (Vidovich) and picked two blokes who ended up at North Adelaide. And they failed to provide any public safety instructions for the North Gawler line. At my sole visit to Gerry’s shop he told me a funny story about Peter Krieg’s card but I think it was the series that was done around the same time for a bakery. I still have Golden crumpets for breakfast every Sunday. Great stuff,Mick some memories there,they didn’t use well known names re the Warriors players ! Are flapjacks still available? Loved ’em as a kid. John Riley- Atomic Physicist. Never gets old. Sticks- Stock Exchange Chalker. See above. Good school that Bays bunch went to – McDermott the other prominent OS of that era. Wasn’t long before it was no longer really a footy school though. By my time most of the footy players went to the catholic school up the road, although Simon Cox was in my year. Love, as Swish has pointed out, the no public transport info for ‘Central Districts’. Not sure why they bothered telling people how to get to Alberton either. 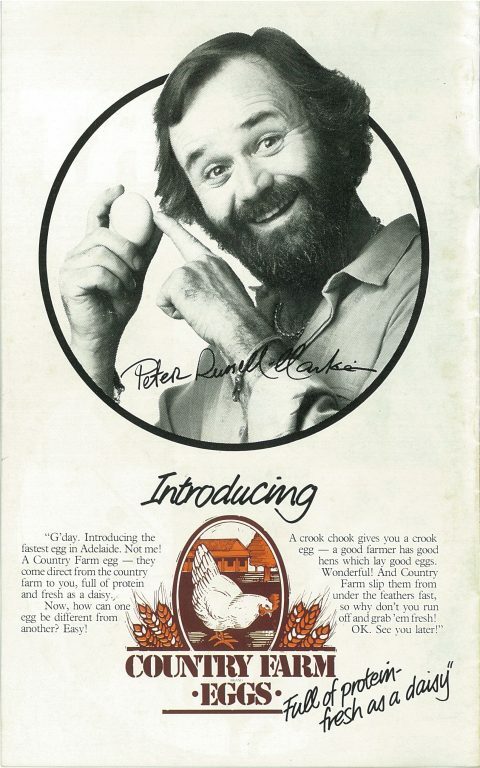 Love Sturt’s logo of that period and the Peckers in their last season by that name. 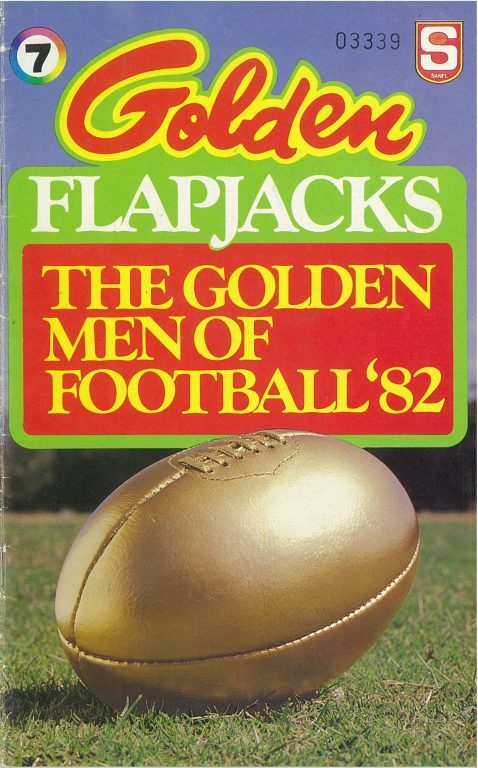 Flapjacks – unfortunate nickname for kids with big ears at my school in 1982. 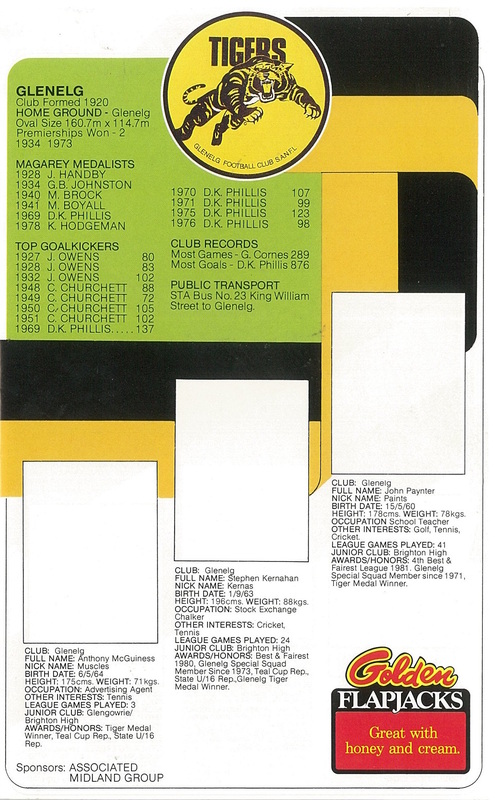 SANFL was such a rich culture full of character and characters. Swish you could add ‘Horse’ to your caution. Not sure how I would handle Little K – Stiffy, however. 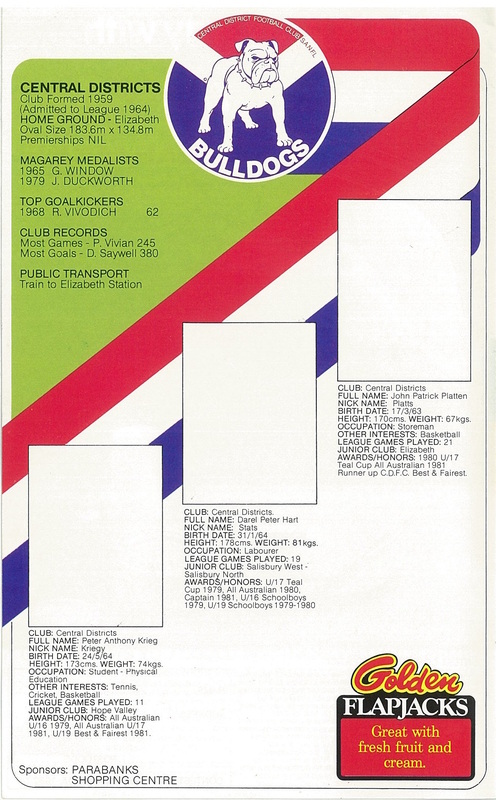 Does Ken Farmer still hold that “Australian Record” for goalkicking? Phil – apparently (and somewhat ironically), “Knackers” is on that list too. 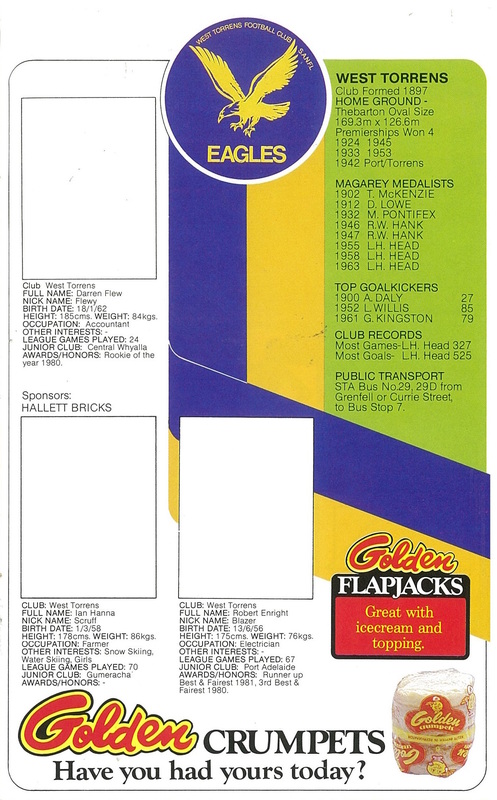 My West Torrens Eagles were a basket case by 1982. Surprised they could find 3 “stars” for the stickers. Find a picture of Ian Anderson from Jethro Tull and stick it in the Ian ‘Scruff” Hanna square. Noone would be able to tell the difference. Great memories MH – thanks. PB – you are getting Ian Hanna and Ian Wallace mixed up. Thick as a brick. Great stuff there, some real rocket science gone into some of those nicknames! My recollection is that John Kantilaftas of the Wessies had black hair, I reckon his nickname may have come from Peter Plus not being able to pronounce Kantilaftas…but the memory is faint! The North Gawler line may not have needed public safety instructions in 1982, although I didn’t use it myself. 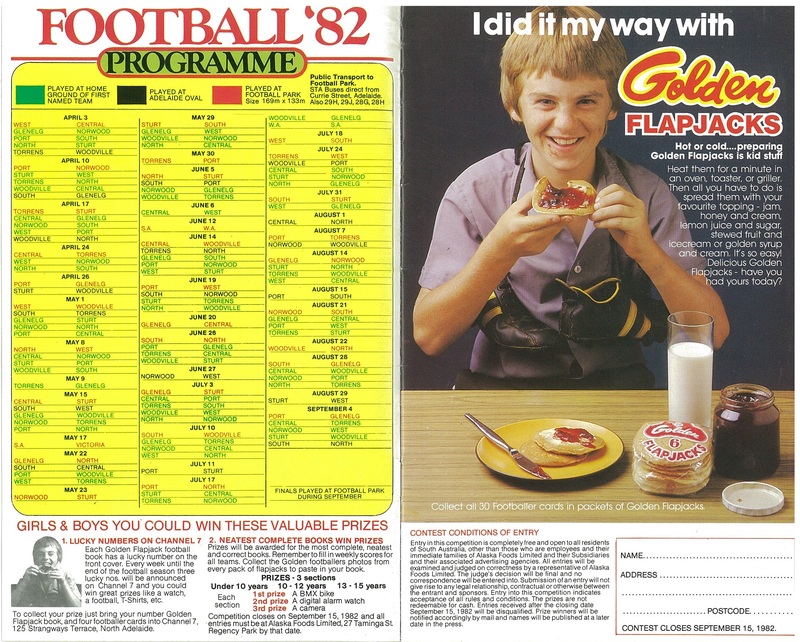 Can’t say I remember Golden Flapjacks as an endorsed SANFL product, Mike. This was the fourth of my five seasons at the League and they certainly never had any promotional events that I can recall being associated with. Worse, they didn’t advertise in the Budget. One night I do remember was a promotion for Hutton’s Footy Franks where we all stood around in the Footy Park Dining Room sampling the worst frankfurts I’ve ever eaten in my life. I guess some of the distaste of that experience was removed by washing them down with West End draught even though I would’ve preferred Cooper’s ale. To answer the Ken Farmer query Swish depends on how you do the counting in senior football. His record of 100 goals in 11 consecutive SANFL seasons and 1419 career goals (from memory) plus 71 in state games (again relying on memory) takes some beating. 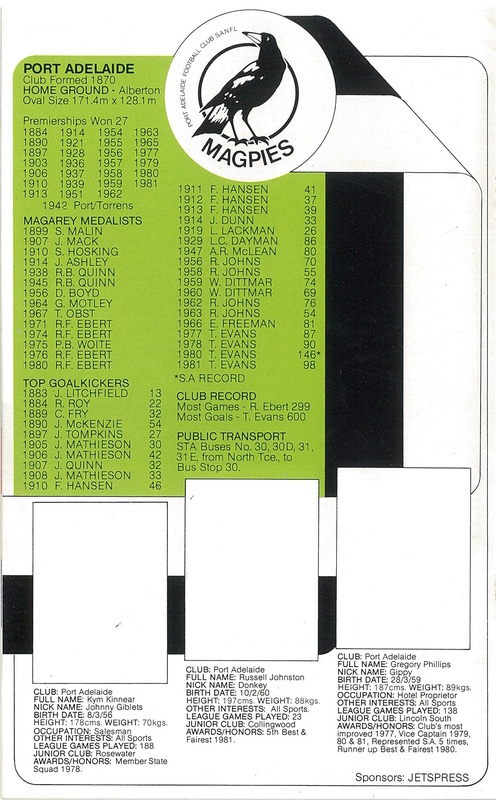 Perhaps Peter Hudson’s 2000+ goals in both Tasmania and Victoria might be considered. Certainly, none of the Vics get close. Doubt Brighton High would ever lose a game. Great to see that they listed John Riley’s occupation. Don’t see anything remotely like that these days. The Port boys have interesting nicknames. 2/3 South players – who? Ditto Torrens. 3/3 at Peckerland! Thank for all the comments and stories everyone. Great to see others find this stuff interesting too. Great post thanks Mike. Whilst not quite on a 43 year delay i have only just picked it up.